Hi everyone, and welcome to the October issue of the Shanville Monthly -- which is coming out nearly a week earlier than scheduled! That's because there are sections in this issue that I wanted to share with you guys before Zom-B goes on sale, so it made more sense for me to release it before I started touring with the book on the 26th. Normal service will be resumed next month!! This is my first multi-book series since The Demonata, so I'm sure that while many of you are looking forward to it, you're maybe a bit anxious as well -- "what if Shan blows it and under-delivers this time?!?" Well, I could sit here and tell you how fabulous and thought-provoking I think the books are, but I WOULD say that, wouldn't I?!? 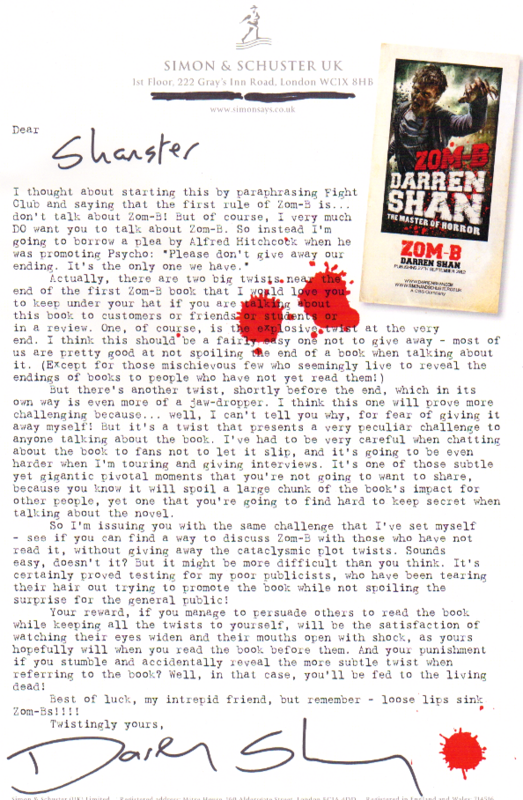 Instead, here are some snippets from reviews of Zom-B by reviewers who were sent advance copies of the book, along with links to the complete reviews, so that you can check that I'm not just picking out positive comments from otherwise negative reivews (like sneaky movie companies often do when advertising their films). So, that's what the reviewers are saying. All that's left for you to do now is read your own copy and decide what YOU think! I hope you enjoy it as much as the gang above did!!! Waterstones are running a Bloodstained Ticket competition. The winners of this will be invited to come to a Zom-B Feast with me early in the new year, where a small group of us will have lunch together in a central London location and discuss all things undead! Entrants must be under 18 years of age, but each winner must bring an adult as a guardian, so older Shansters can get in on the action too -- you just need to find a kid to enter the comp! Entry closes at the end of October. Only open to fans in the UK and Ireland. To enter the competition, CLICK HERE. 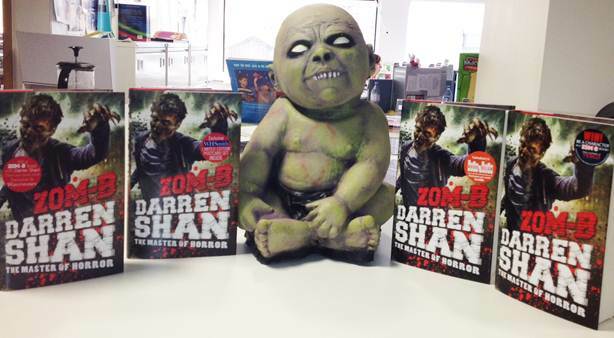 WHSmith are offering a giveaway of a Zom-B set of postcards (there are three postcards in the set). 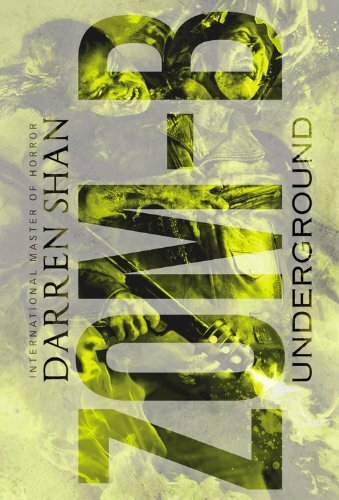 Sainsburys are offering a giveaway of a Zom-B Undergound postcard print (Zom-B Underground is the second book in the series, and the postcard will be based on its cover). Tesco are running a competition in which one winner will get a character named after him or her in the fourth Zom-B book. There's a possibilty that the character might pop up in later books too, but I can't guarantee that -- it depends on whether or not they survive book 4!!!! This is a VERY rare chance to have your name included in one of my books. I have only done this twice before, and on those occasions it was an auction, where the winning bidders had to go as high as £2000!!! There is no age limit. Only open to fans in the UK and Ireland. Entry closes at the end of October. To enter, CLICK HERE. Easons in Ireland are offering a giveaway of an A2 sized Zom-B poster featuring a replica of my signature and a message which I wrote especially for the poster. In Asda, Zom-B will be their Teenage Book Of The Month. While they're not giving anything away with their editions of the book, that will mean that it will be VERY keenly priced all the way through October! I have also signed lots of copies of the book for independent book stores, so if you can't make it to any of my events or signings (see below), you still might be able to get hold of a signed copy in your local indie store. As far as I'm aware, all of the competitions are also valid in Ireland as well as the UK -- but I might be wrong about that, so if in doubt, please check in-store before purchasing. Fans in the USA, Canada, Australia and New Zealand -- I don't know of any special editions or giveaway that are being planned in your territories, but that's not to say there won't be any. If I find out, I'll let you all know. But, regardless of giveaways and competitions, the book by itself is a marvellous monster, and it will definitely be on sale all across your country by the middle of October at the latest -- so watch out for it!! Yes, it's as vicious and action-packed as the cover indicates! After a more or less traditional zombie-ish opening to the series (a group of humans are trapped by a group of zombies and have to run and fight for their lives), Book 1 ended on a huge cliffhanger, and Zom-B Underground is when things start to twist off into uncharted territories, as I set out to reinvent just about everything we think we know about zombies and how a zombie story should work. The third book continues to move things forward in unexpected directions. It is due to be released in March 2013 (a bit earlier than originally planned, so that I can tour with it before I head off on my honeymoon -- see, I think about you guys even when I'm getting married!!). But I will be revealing the title, as well as the UK cover for it, at the end of this month, on Halloween! Something to look forward to before you head out trick-or-treating for the night!!! My latest book for older readers, Lady of the Shades, went on sale at the end of August in Australia, New Zealand, the UK and Ireland. It's been getting amazing feedback from fans, as well as from critics (the Times in the UK called it "gripping from first page to last.") -- the twists seem to have caught just about everyone by surprise! I've retweeted messages from fans over on my Twitter page, while you can find the reviews from critics by CLICKING HERE. I have been giving (and will continue to give) lots of interviews in the run-up to the release of Zom-B. I will let you guys know about these as and when they become available. I'll provide a round-up of them in next month's issue of the Shanville Monthly, but if you want to be among the first to find out what I have to say about Zom-B (and lots of other stuff too), follow me on Twitter or Facebook for day-by-day updates. I'll also be posting links to new reviews, tour updates, and a whole lot more. In the meantime, if you want to read an extensive, probing interview with me that appeared on the ACHUKA site (as well as one of my earliest interviews ever, from many years ago) then CLICK HERE. There is also a lengthy interview with me on the We Love This Book site, which I would recommend. CLICK HERE. I was also interviewed, along with several other writers, for a piece in the Sunday Independant in Ireland, about Irish authors who write for adults as well as children. You can find it if you CLICK HERE. I embarked on a major tour of the UK and Ireland on September 27th, which runs through to October 7th (with an extra, home-based Halloween signing coming later), to support the release of the first Zom-B book. You can find the tour details below. A school event is for invited schools only. A public event is open to anyone who wishes to attend, but tickets normally need to be reserved in advance -- you should always contact the organiser in advance. A public signing is open to anyone who turns up -- there are no limits on numbers. Please note, I am always happy to sign as many of my books as fans wish to bring along from home or buy on the day. 10.00am -- prison event, HMYOI ISIS, Thamesmead. 1.00pm -- school event, Old Buckenham High School, Norfolk. 11.15am -- school event, Dame Alice Owens School, Potters Bar. 2.00pm -- school event, Lochinver House School, Potters Bar. 7.00pm -- public event, The Bull Theatre, High Street, Barnet. 11.00am -- public signing, Waterstones Bournemouth, Unit 1, West Mall, Castlepoint, Castle Lane West, BH8 9UY. 2.30pm -- public signing, Waterstones Yeovil, 37a Middle Street, BA 20 1LG. 11.00am -- public event, Waterstones Taunton, East Street, Taunton. 10.30am -- school event, Nova Hreod College, Swindon. 6.30pm -- public event, Waterstones Reading, 89a Broad Street, RG1 2AP. 10.05am -- schools event, Fir Vale School, Sheffield. 1.30pm -- schools event, Fulneck School, Pudsley, Leeds. 09.15am -- schools event, St Augustine School, Billington, Clitheroe. 1.00pm -- schools event, Grand Theatre Blackpool. contact [email protected] for more info or tickets. 7.00pm -- public event, Waterstones Manchester Deansgate, 91 Deansgate, M3 2BW. 09.30am -- schools event, Archbishop Blanch School, Liverpool. 2.45pm -- school event, Weskey College, Dublin. 5.00pm -- public event, Easons O'Connell Street, Dublin. 2.00pm -- public event, Pavilion Theatre, Dun Laoighre, County Dublin. 12.00pm -- public signing, Waterstones Cork, 69 Patrick Street, Cork. 4.30pm -- special Halloween public signing, Easons Limerick.